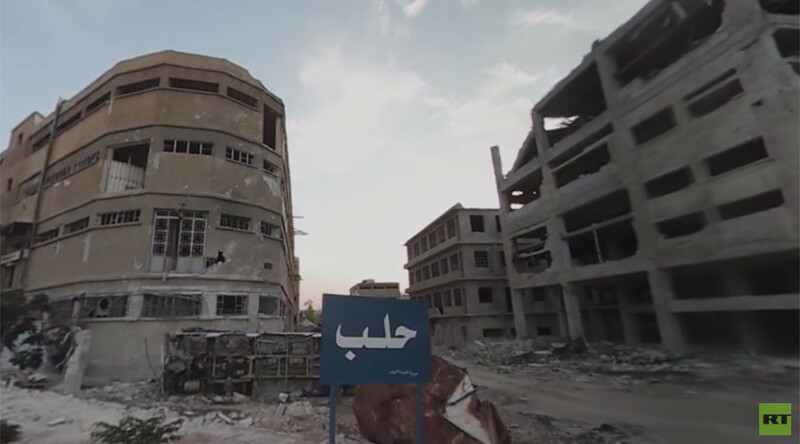 RT has visited an abandoned neighborhood in Aleppo, Syria, to make a 360 video of the devastation caused by months of fighting between government forces and militants. Not long ago, the front line was located in the Al-Layramoun district, but now the area is abandoned. “The people who worked and lived here… everyone’s gone. There are only soldiers,” RT's Murad Gazdiev said as he walked through the empty streets. The area is still considered a warzone, with explosions, artillery and the sound of fighting clearly heard in the background in the video. According to the RT correspondent, “it was hell” in Al-Layramoun when the government forces and the militants occupied neighboring buildings in area. “You can tell by the state of the buildings how fierce it was… It was street fighting for building after building. They’d run across in an attempt to storm each other. They’d lob grenades, RPGs, rockets,” he said. There are no windows in any of the bullet-riddled buildings in Al-Layramoun, and the streets are covered with overturned buses, which the militants used as barricades. However, the most “stunning thing” about the abandoned neighborhood is that “it’s absolutely silent” and “so eerie here,” Gazdiev said. Aleppo has been divided between the government forces and the militants since the start of the Syrian conflict back in 2011. In recent weeks, the Syrian Army has made significant gains in eastern Aleppo, allowing thousands of civilians to flee the area and receive humanitarian assistance. Over 13,000 people have been rescued from militant-held parts of the city with the help of the Russian Center for Reconciliation in the past 24 hours, while more than 700 militants have laid down their arms, the Russian Defense Ministry said on Monday.